Nose: Intoxicatingly fruity–green apples, nectarine–along with honey and slowly expanding wood and vanilla. The wood is not harsh or tannic in the slightest; it provides a mild, toasted base for the fruit to rest on. With time there are increased notes of rye and wood spice, but it’s all perfectly balanced. Water doesn’t improve the nose. Palate: Not as much fruit on the palate at first. Opens with a rich malty note that opens out into fruit with time–more citrus here than on the palate. There’s toasted wood here too–as unobtrusive as on the nose. Spicy notes begin to develop at the end and lead into the finish. Water brings out a fair bit of pepper and rye–much spicier now. Gets a little sweeter too now. Finish: Long. Spicy leading to salty at first. After a while the malty notes linger as well. Hint of cocoa powder at the very end. Sweeter with water. Comments: The nose is my favourite part but time and patience allow the palate to shine as well. Water is optional–the nose is better neat, but the palate might be more interesting if you add water halfway through. Either way, this is not one to rush. Really quite a lovely whisky, on the whole, and I wish it were available in the US as well. Come on Suntory, give us more Hakushu! 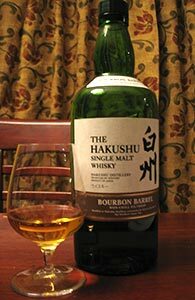 This entry was posted in -Whisky by Rating, 85-89 points, Hakushu. Bookmark the permalink.